Not all pool customers want the same things out of their pools. We’ve learned over the past 40 years that every customer who contacts us has their own unique needs, desires, and circumstances. What are you looking for in a swimming pool? These answers help determine the right pool for you, your home, and your family. What makes the perfect pool for your neighbor might not fit your needs and lifestyle well at all. At Aqua Pools, we often find that fiberglass pools are the ideal solution for many customers. First, fiberglass pools are one of the few types of pools that withstand years of constant freezing and thawing cycles seen in the Midwest, which lay waste to pools of lesser construction. Inferior pool materials would be broken to bits in our climate. Fiberglass pools are actually 17 times stronger than concrete! Furthermore, you won’t get the scrapes and scratches with a smooth fiberglass pool that you can in concrete pools. Have you ever bought a brand new swimsuit for vacation, only to snag and ruin it in the hotel swimming pool? Maybe your child played in the hotel pool all afternoon and cried with blisters all night afterward. Yeah, that’s why Aqua Pools doesn’t do concrete pools. Another benefit to the smooth surface of a fiberglass pool is that the permanent gel coat finish is nonporous. This means that you can use stronger chemicals, and there’s less chance of algae or other contaminants affixing to the walls of the pool. There’s no liner to replace every so often, and the finish doesn’t fade and deteriorate over time. Have you ever seen a vinyl pool liner that’s been punctured and patched or faded in the sunlight? Yeah, it never looks brand new again until you get a whole new liner. Unfortunately, liner replacements eat into your enjoyment of the pool! With a fiberglass pool, once your pool has been properly opened for the season, you’re sure to have an amazing summer until the first nips of fall chill fill the air. Fiberglass pools are not only less costly over the long term (all that money you save not having to replace liners), but the weekly maintenance is less costly, as well. Algae is less prone to thriving on the walls, since the walls are nonporous. This means less chemicals can do the same job. In fact, a fiberglass pool can require up to 70% less chemicals than other pool alternatives. Less chemicals also means you can run your pump at more energy-efficient speeds, so you can add energy savings to your overall lower operational costs with a fiberglass pools. This isn’t just good financially, it’s also kinder to the environment. Why Choose Viking Fiberglass Pools? Perhaps you’ve decided that a fiberglass pool is right for you, but you aren’t sure why a Viking fiberglass pool is any better than others on the market. 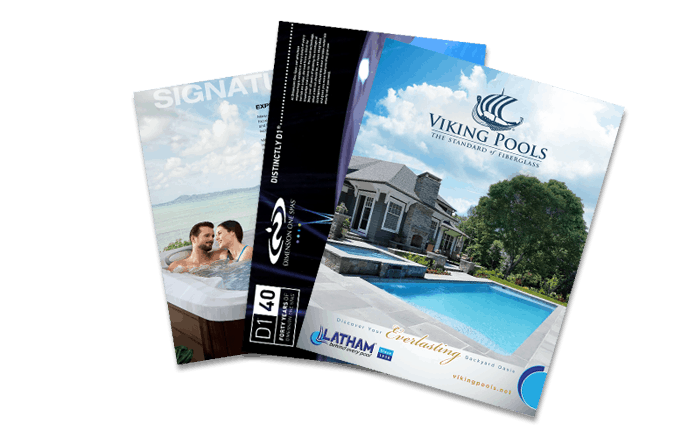 Aqua Pools chose to partner with Viking Pools for a number of reasons. First, their quality is more than hype. They manufacture more fiberglass pools than any other company in the world. They have over 30 years experience, and have literally established the industry standards. Their quality garners the recognition of ICC-Evaluation Services, which has issued Viking Pools their stamp of approval. The ICC-ES is a nonprofit organization that evaluates the pool industry in terms of building materials, techniques, and overall quality. Not only does the ICC-ES recognize Viking Pools for their quality craftsmanship, but also for their innovative designs. Aqua Pools gained our local reputation in the Chicagoland area for our high quality, and our partnership with Viking Pools is part of the reason why.